- Masked by the verdant growth of her woodland home, the Green Woman gazes forth with eyes both wise and wild. T-shirts are 100% cotton, and are printed with environmentally safe, water-based inks. Choose Size... Small - Only 1 left! Medium - Sorry, Sold Out! Large - Sorry, Sold Out! X-Large - Sorry, Sold Out! 2X-Large (Clearance - $9.00) - Sorry, Sold Out! 3X-Large (Clearance - $9.00) - Sorry, Sold Out! 4X-Large (Clearance - $9.00) - Sorry, Sold Out! 5X-Large (Clearance - $9.00) - Sorry, Sold Out! Please choose the Size. The shirts are hand-dyed, giving a unique background to every shirt, before being screen-printed with some of the most extraordinary artwork we have seen offered on clothing. The shirts are made of 100% cotton, and are pre-shrunk. 1. Turn garment inside out. 2. Set wash temperature to cold. 3. Line dry or tumble dry low. 4. Do not bleach or dry clean. 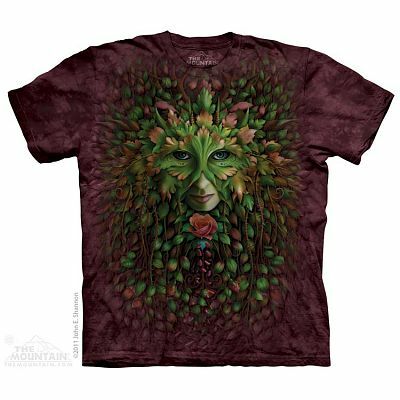 Do you have any other questions about our Green Woman T-Shirt? I had ordered this tshirt from a different company I was more familiar with. It took two weeks for them to let me know that it was out of stock and a refund of my money was not an option. I could choose another shirt or wait until it was in stock again. I was not happy. So, I began a search for the green woman tshirt and found your wonderful shop. I am more satisfied than I could have imagined. The communication was great, the shipping was lightning fast. I can't wait to give this gift and I definately will be shopping from you again. I'm a huge fan for life!!!! Hi Karen - Welcome to Gryphon's Moon! We do our best to offer the service we want to have when we shop. Thank you so much for the glowing review and please tell your friends and family about us! I bought the shirt as a gift for my girlfriend, as she kept wanting to borrow my greenman shirt. Now she has one of her own to wear and she loves it. Greaat prices, excellent merchandise, and fast shipping. Whats not to love about this company? Bought it for the birthday of a friend of mine and I'm sure she'll will love it ! Shirt is high quality and colors are beautiful as the design is ! Received it quickly, here in France. I love my new shirt! The texture is soft & the colors are yummy. Beautiful shirt!! Soft, colorful and just a lovely addition to my wardrobe! !